A grey Thursday in late autumn. On a nondescript sofa in a dull office sits a sportsman who was anything but. 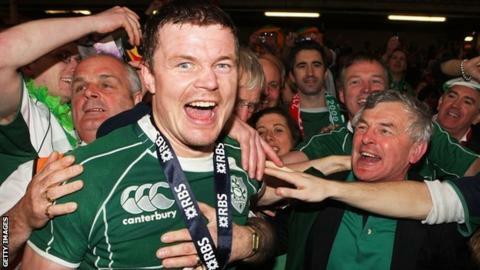 In a top-flight career spanning a decade and a half, former Ireland captain Brian O'Driscoll - the most capped player in international history - defined what rugby union was and what a centre could be. And so there could be no better man, as the autumn internationals come to town, to draw us closer to some of the game's fundamental truths - and to what made this self-deprecating boy from Clontarf in the suburbs of Dublin the outstanding player and on-field leader of his era. An assumption that many of us will take into the next four weeks, as England, Wales, Ireland and Scotland take on the nations that between them have won six of the seven World Cups. England's wins over New Zealand and Australia in the build-up to the 2003 tournament convinced even the wary that they were a team who could go all the way. Wales' failure to do the same, despite a period in which they won three Grand Slams in eight seasons, has been taken by some as a fundamental flaw. Arguably, those Wales teams - particularly that of 2012 - had already established themselves as great sides. But what if taming those southern hemisphere beasts was never enough anyway? "In 2006 we beat South Africa and Australia," says former Ireland captain O'Driscoll. "In 2009 we beat South Africa and drew with Australia. "But the big time to do it is when it matters in World Cups. And in 2011 we beat Australia but lost to Wales in the quarter-finals. "You have to be able to back it up a second and third time. That gets you to a semi or final. A one-off win only gets you out of your pool. "That's why our [last-gasp] defeat by New Zealand in 2013 doesn't rankle with me like maybe it should. "Because no-one has ever beaten the All Blacks in Ireland, it would have been lovely to do it. But not beating them is only the second biggest regret of my career. My biggest is the quarter-final defeat against Wales." It makes logical sense: if you want to be the best in the world at what you do, you should hammer ceaselessly away at the parts of your game where you struggle. Except the most capped player in the world, the most complete centre of his generation, believes the opposite is true. "Practise things you're good at," O'Driscoll says. "Keep on top of things you're not so good at, but be world-class at your best. Never think, I'm very good at this and that, I can leave those for a bit. "What do you remember about Jason Robinson? His feet. Not how improved he was under a high ball or his kicking skills. Everyone remembers those feet. He could go round you in a phone box." O'Driscoll always had a supernatural ability to see what others could not in the split-second chaos of a match. His reaction was to do even more analysis. Former England full-back Robinson "could go round you in a phone box"
"I put more speed into my brain," he says, simply. "Understanding myself, where I could take shortcuts; understanding the opposition, and what they favoured, whether they had habits. "I'd do a minimum of an hour, hour-and-a-half the night before a game. I wrote notes before every match, and I always wrote them fresh. No matter how many times I'd played against someone, I'd bin the last lot and start again. "I'd take one of the pads from the hotel room I was staying in and I'd write them all out. Before we got on the bus to the stadium I'd go through them. Sometimes they'd come to the game. Take in the information, see the patterns." In Leinster's 2009 Heineken Cup semi-final against great rivals Munster, he was able to pull off a critical intercept try because he spotted the tiniest kink in Ronan O'Gara's pass, a little double-pump that he - not even O'Gara - knew signalled a long miss-pass. "That's the kick that I'd get - reading a pass, reading a step, knowing it was coming. Getting a turnover because I knew a guy was going to be hit up the middle off a play." About yourself, about your desire, about what more you have to do to reach the top. Or do you? "I don't think that's true," says O'Driscoll, chewing the plastic lid of his bottle of water. "Winning the Grand Slam with Ireland changed us at Leinster. For me it got rid of the stress of only having won a single Celtic League from 2000, and a few Triple Crowns from which you get no medal. Aged 29, I only had one medal to my name. "All the losses against the All Blacks didn't show us too much, did they? There wasn't enough of a lesson from them to go out and put in a better performance the next time. "The feeling of that Slam inspired us to go on and win more. No, you learn more from your victories." O'Driscoll on whether statistics matter? "They do sometimes. They're not the be-all and end-all, but if they are they to be got, there is satisfaction there. When I became leading try scorer in the Five and Six Nations, that's a long-standing record. I'm about to lose my 141 [Test caps record], and it's hard to argue with whom I'm going to lose it to. [New Zealand captain] Richie McCaw will reach 150. Will that ever be beaten? Ask [Wales winger] George North: 22 years old, 45 international caps." The All Blacks side which won the 2011 World Cup on home soil had 636 caps in its starting line-up for the final. In 2007, South Africa's world champions boasted 602; in 2003, England lined up with 565 international appearances between them. The likely England side to take on the All Blacks next Saturday will have nowhere close to that. Neither will the Welsh nor Ireland sides who play the same day. Does that mean none have a chance of lifting the Webb Ellis trophy in October next year? Maybe not. In 2007, Ireland went to the World Cup in France with their most experienced side ever. Four years later they travelled to New Zealand with an average age higher than any other team, and went out in the quarter-finals. In France they failed to get out of their group. "We were so undercooked," remembers their captain. "There was so much focus, in a [physically] small team, on 'we need to get bigger, or we won't survive against France or Argentina'. The first five weeks of pre-season we didn't touch a ball. "If you stop doing a skill you've done for years for any period of time, there's an adjustment period to get it back. In anything you do. Motor skills won't work as fast, because repetition is everything. "You're always thinking best-case - I'll be fine. But we never got going." Experience helps. But it is only one factor, and it can be overridden by more critical ones. One of the favoured old cliches that emerges in every Six Nations campaign: it doesn't matter how badly the rest of the tournament goes for Ireland, Wales or Scotland, as long as they beat England. In an era where both Wales and Ireland have won more Grand Slams than the men in white, and when the rivalry between those two Celtic nations has been built up by Warren Gatland, among others, isn't that all as old-fashioned as 11-stone scrum-halves and props who can't pass? "It's true," admits O'Driscoll. "It's a bigger one-off game, because it still is to the nation. "We like beating England at anything. We beat England at cricket a few years ago. I didn't even know we played cricket until we beat England. "We didn't use it in team-talks, but we didn't have to. But you up your game against England too because you know how good they are. "I was on the end of a couple of humiliations in the early days. And that gave me an extra little incentive. "But has an Ireland team ever beaten England by just playing all right? No. Whenever we've beaten them, we've played pretty well. You know you have to get it right, and that gives the whole week a little extra spice." O'Driscoll has scored more tries for Ireland than any other man. He scored more in the Five and Six Nations than any player from any country. And the thing that gave him the biggest buzz on the pitch? "It was always a tackle. In the France game when I got three tries [in Paris, 2000] I hit Philippe Bernat-Salles and turned the ball over. "Now the last try is a good try, a good pick-up. But I was only a young lad of 20, and I got a real thrill from that hit. "He had grey hair! And I really, really hit him flush. He crumbled. And spilled the ball. I got a serious kick from that." By the time his international career ended with the Six Nations title in Paris last March, O'Driscoll - a wonderful attacking player with a swerve, with beautiful hands, with vision - had produced 21 more turnovers than any other player, forward or back - in the tournament's history. He loved every one. "It was a bit, at the start, that those hits weren't expected so much from a centre. And I was one of the smaller lads. Being able to surprise people was always nice. "That's why I enjoyed the stealing of the ball, because it wasn't typical of a centre. Myself and Darce [Gordon d'Arcy], it became our thing." O'Driscoll tells an amusing tale about a team-bonding exercise run by former Wales coach Mike Ruddock when he was in charge of Leinster. Told they were heading off for a golf day, O'Driscoll and his team-mates were surprised to be dropped off with their clubs in the middle of the Wicklow Mountains. Rather than enjoying a few rounds and several scoops, they would spend the next 24 hours in the wilderness with a group of former soldiers, marching through the night in thin V-necked knitwear and sodden spikes. If that experience failed to turn Leinster from underachievers to kings of Europe, no-one should be surprised. But O'Driscoll believes the theory was flawed as much as the practical. "[Leinster and Ireland fly-half] Johnny Sexton and I would often have shouting matches," says O'Driscoll. "Were we all best of pals in the Grand Slam team of 2009? We were tight, but only as tight as international teams could be. Because you don't spend that much time together. "We knocked on the door five or six times, coming second in the Six Nations. Beaten in the Grand Slam game in 2003. Should have won the title in 2007. But it's very hard to be best buds with lads you don't see that much of. And they're coming and going. "The provincial side is where your real pals are. With Leinster, there was less of a split between first team and peripheral players in later years, and that helped us. Not the team bonding in Wicklow." O'Driscoll, at 5ft 10in and 14 stone, began his Ireland career as a sizeable centre with power to match his pace. By the end he was almost an anachronism, dwarfed by 2013 Lions team-mates Jamie Roberts and Jonathan Davies. A bad thing for those who play and watch the game? Maybe. Maybe not. "I do think the game is going towards athletes becoming rugby players rather than rugby players becoming athletic. For the smaller guy that may be a bad thing, a bit. "When it becomes such a power-oriented game, you can't fight physics. Or there's only so hard you can fight it. The bigger guy is going to win a collision more often than not, if he runs aggressively. If I run aggressively and Jamie Roberts runs aggressively, there's a good chance he's going to win that collision. I'm a realist with that. "But you can get your own little kick out of that. Because you have to start thinking that little bit better. Catching guys off guard. Seeing things a fraction earlier, so you can get the edge. "In the Lions tour of '09, I knew that Danie Roussow hadn't seen me. That's why I shot out of the line fast, because I could catch him blind. "I thought I could catch Brodie Retallick blind in the All Blacks game last year. But he saw me, and I got concussed. If I was there half a second earlier I would have dominated that collision, but he saw me, and gave a little dip. "That's the margin between the two - I was sparked in both, but I was the aggressor in one, and he dominated the other. "I thought I always had to get the jump to win those moments. And that made it not more or less enjoyable, just different." The one at the back who said there is, and it's called France - sit down and behave. But as someone who suffered on several occasions from the more brutal side of international rugby, never more so than in the first Lions Test of 2005 when he was dump-tackled by Tana Umaga and Keven Mealamu and dislocated a shoulder inside the first 90 seconds of the first Test, where does O'Driscoll draw the line? "Violence is a word with a big range," he says carefully. "I would use violence in my team talks, about being violent in the collisions, hitting rucks being violent. "If you get an opportunity and someone leaves their ribcage open, be violent and smash them. But legally. I don't think there's room in the game for stamping, gouging, tip-tackling. "I was never a pre-empter. Defending my team-mate if someone piles in on them, yes. The other stuff, no." And of that Lions tackle, the one that wrecked his shoulder and series? "Here's another one for you. Time heals all. Definitely. It does. I've been pretty good at parking stuff relatively early, without blowing my own trumpet. It's something I can do."